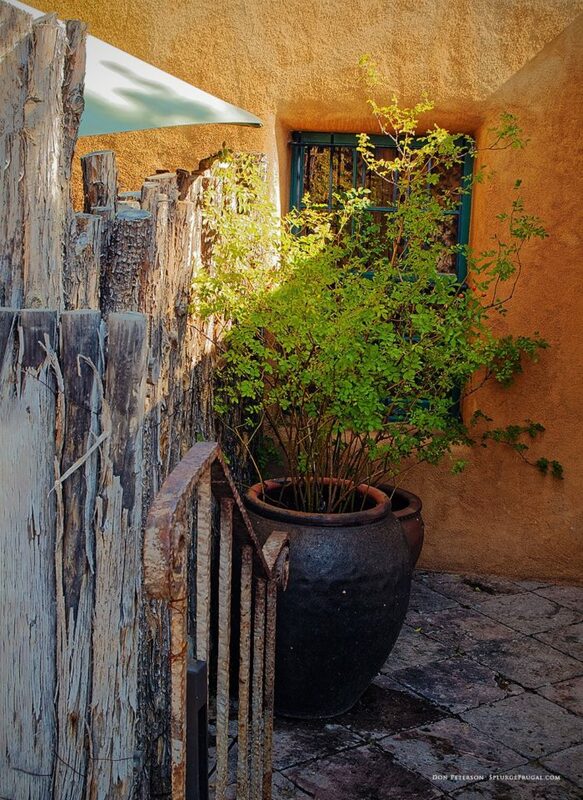 The photo above shows the lovely patina and details of a home located on Canyon Road in Santa Fe, New Mexico. I choose a cloudy white balance to warm up the Adobe colors in this photo shot on an overcast day. The camera is a vintage Canon 10D with a 50mm F1.8 lens. In this photo featuring a setting from a Canyon Road art gallery, I used a cloudy white balance to give the Adobe textures and wood greater warmth. Camera: Canon 10D, 18-55mm kit lens. Santa Fe, New Mexico is a photographer’s dream! It is a historic city that celebrates beauty in its architecture and adornment. 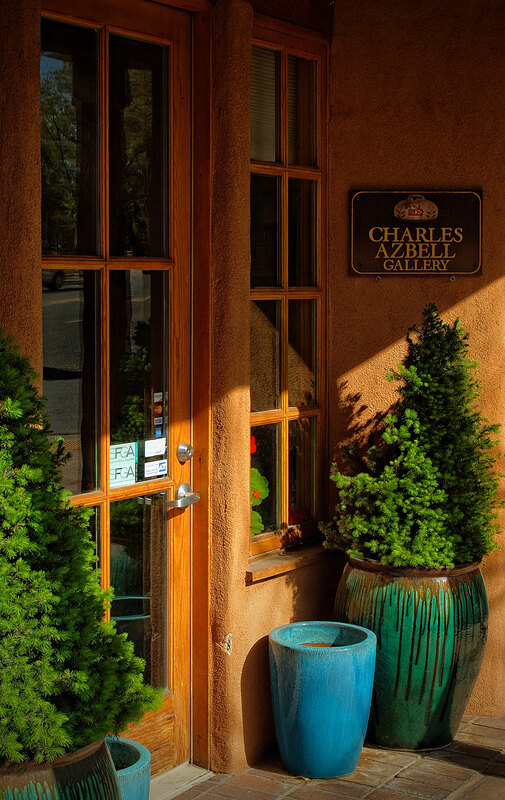 The ancient Anasazi culture gives Santa Fe its timeless Pueblo-style design language, making this one of the most beautiful cities in the United States, if not the world. In the photo above, shot at midday, much of the detail was hidden by dark shadows. I shot this photo using my camera’s raw setting and recovered much of the detail lost in the shadows using the shadow recovery slider in Adobe Lightroom. 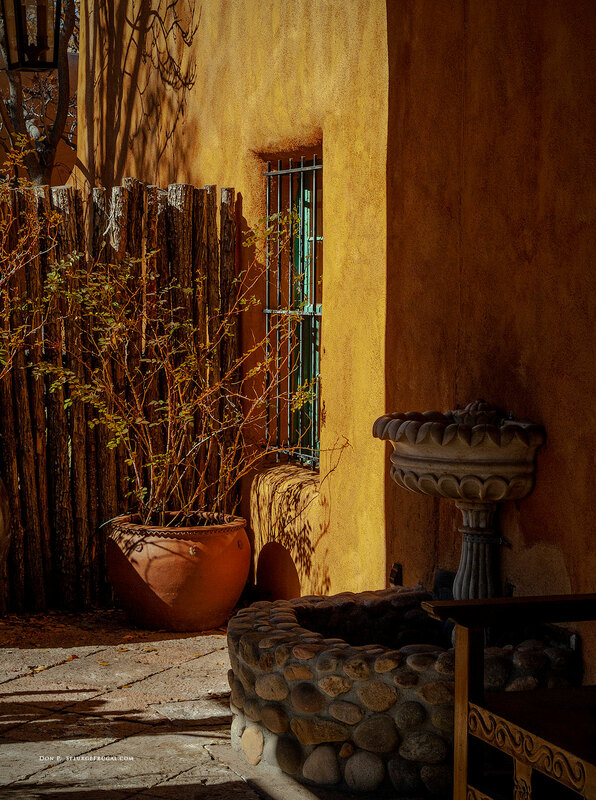 If you plan to visit Santa Fe, this article will help you to capture memorable photographic impressions of this southwestern jewel. 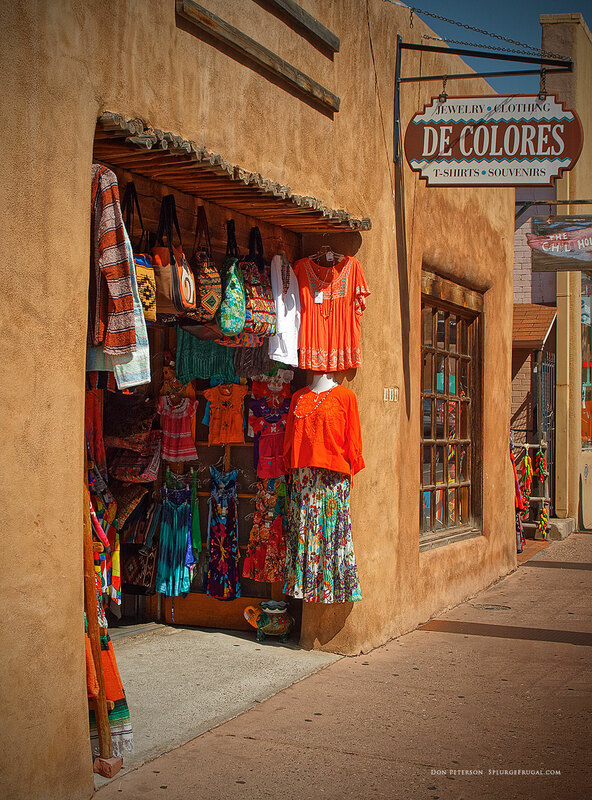 Santa Fe, New Mexico is an intimate, walkable city with utterly charming Pueblo-style architecture that makes it one of the most photogenic cities in the United States. Santa Fe is an intimate, walkable city. Although it is the state capital of New Mexico, it does not have the overarching downtown typical of most urban centers. In fact, the New Mexico State Capital building is only three stories tall. The three tallest buildings in Santa Fe, at 5 stories each, are the Eldorado Hotel & Spa, the Inn and Spa at Loretto, and the La Fonda Hotel. For this reason, the Santa Fe skyline blends beautifully with its handsome high-desert setting. Santa Fe, NM. Your Table Is Ready! 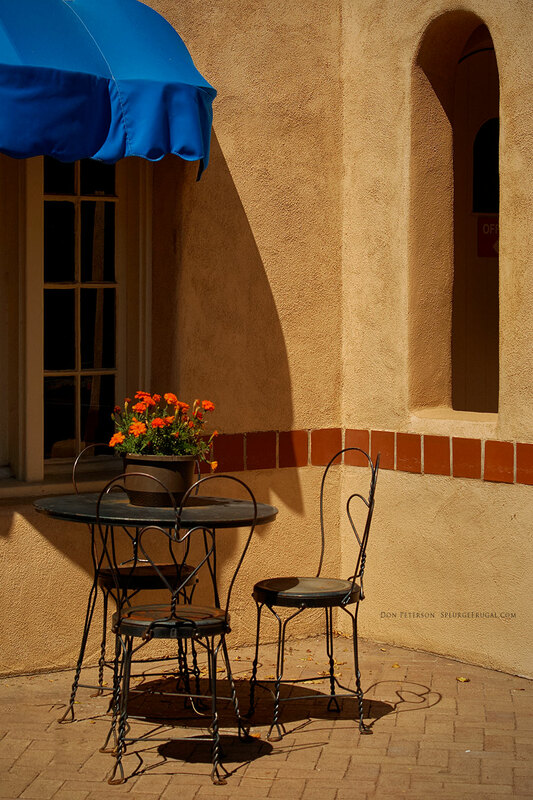 This charming cafe setting in Santa Fe, New Mexico shows why this is one of the most beautiful cities in the United States, if not the world. The Pueblo, Spanish, and Anglo cultures interweave the old with the new in Santa Fe, forming a city this is as artistic as the galleries that call it home. I like to call Santa Fe my local Paris, as it has a sophistication as refined and distinct as that European art capital. This photo, shot in raw, required the use of the Highlight Recovery and Shadow sliders in Adobe Lightroom to restore lost highlight detail and lighten shadows. 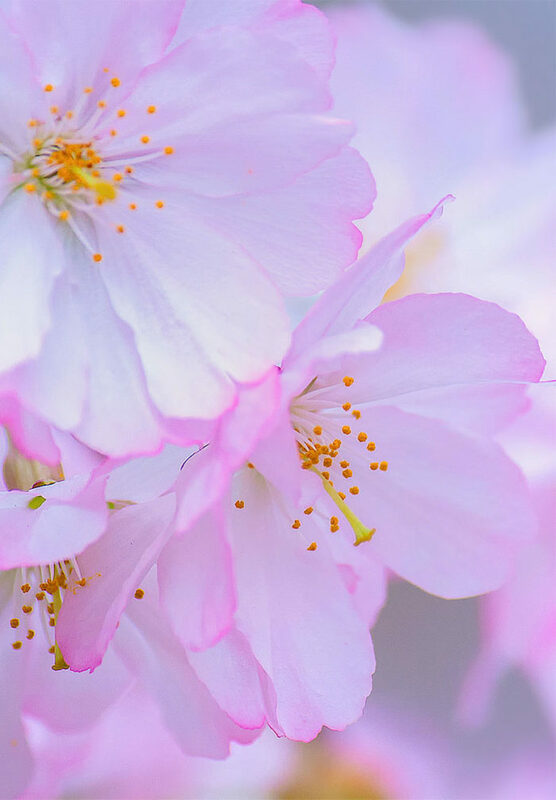 Shooting in raw and using Adobe Lightroom to post process your images gives you much greater control over the final look of your image than shooting in standard jpeg format. 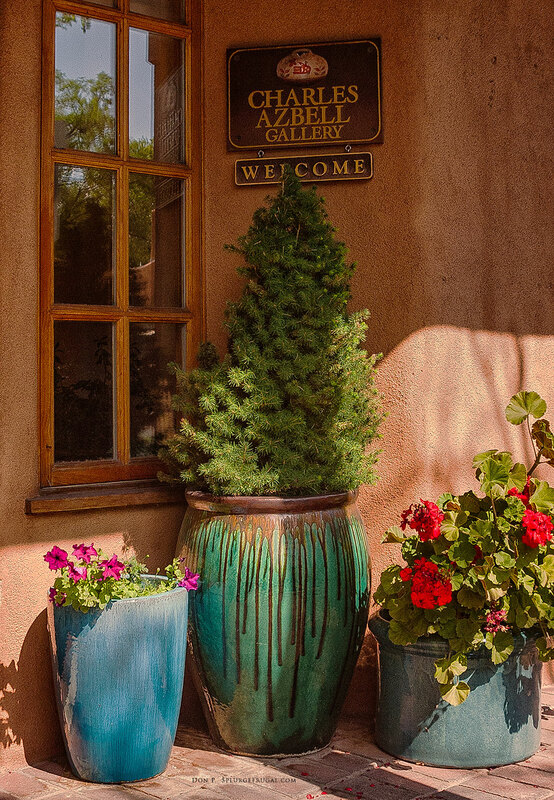 Capturing the best of Santa Fe does not require special photographic equipment. In fact, a standard 18-55mm ‘kit’ (the lens sold with your camera) lens is perfectly suited for photographing Santa Fe. Its most compelling features are at or near eye level and do not require any extended telephoto or ultra-wide lenses to photograph well. Nearly all of my photos of Santa Fe featured on this website were shot with a standard 18-55mm zoom lens. Santa Fe has no shortage of light! Powder blue New Mexico skies can be expected at least 300 days of the year. By shooting in the early morning or late afternoon you will avoid the harsh shadows and glare of midday. 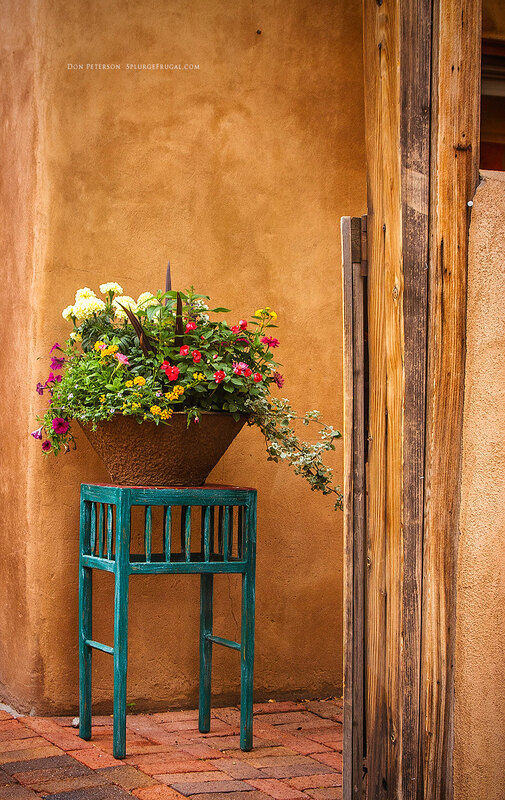 The colors and textures of Santa Fe look best at those times. Be sure to use a polarizer filter to cut down on reflections and get the best color out of those blue skies. If you use the “Cloudy” white balance setting on your camera it adds a bit of richness to the Adobe colors and textures that adorn nearly all of Santa Fe’s architecture. I find that the normal “Sunny” setting tends to wash out the tan Adobe colors a bit. The cloudy white balance setting warms the Adobe colors that harsh sunlight tends to wash out. Partially cloudy skies offer ideal conditions for capturing street level details in the best light. The clouds bounce light into the shadows, providing softer shadows that flatter Adobe textures and colors. If you have a partially cloudy day get out your camera! 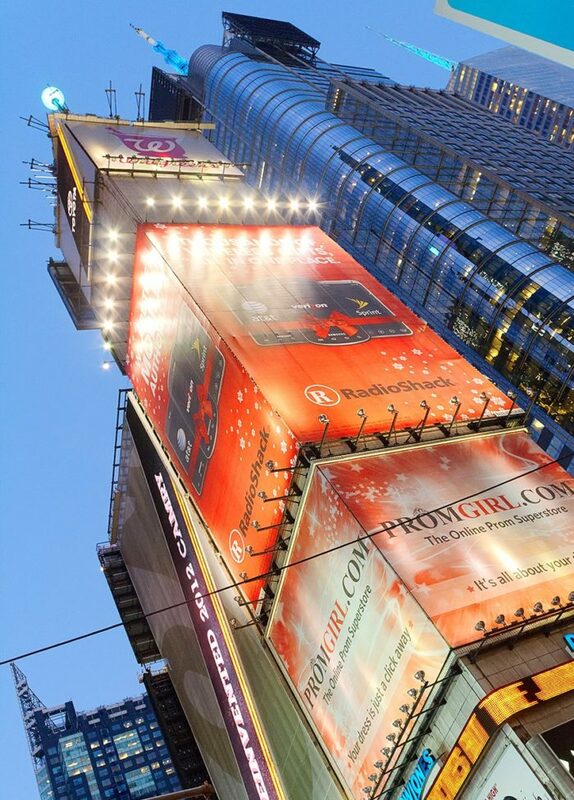 You will capture your best photos in this light. Most of the photos on this page were shot under partially cloudy skies. There is no need to bring a tripod on your visit to Santa Fe. You will have plenty of sunlight! But this raises another question: What about post-sunset and night photography? Santa Fe is not a 24-hour city. By 6 PM, most businesses are closing with the exception of hotels and restaurants. By 10 PM, the city is asleep with the exception of a few bars. Most downtown buildings are not illuminated at night, beyond its three largest hotels and the facade of the St. Francis Cathedral. Truthfully, there is not much to photograph after sunset. The one exception to this is the Christmas season when many of the downtown buildings are adorned with traditional holiday luminarias (New Mexico’s Christmas lights). Santa Fe, New Mexico has a beauty that is intimate and accessible. Its greatest charms are at eye level and within reach. Really, your most important piece of photographic gear is a pair of comfortable walking shoes. The city is a walkable, living art gallery that rewards exploration. Slow down. There’s beauty in the details. In the photo above the use of cloudy white balance adds an appealing warmth to the Adobe and wood tones and textures. 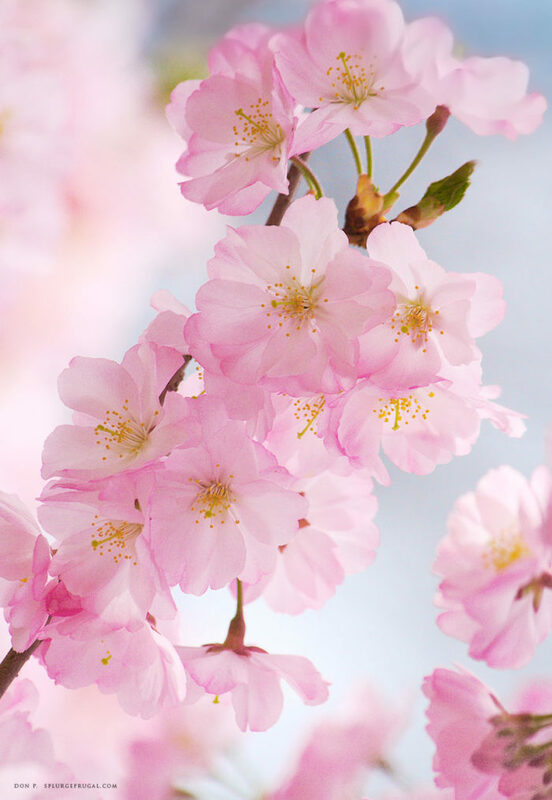 Shooting in auto or sunny white balance settings will make your warm tones appear duller. The one street I recommend for new visitors to explore in Santa Fe is Canyon Road. Easily accessible from the downtown Plaza, Canyon Road is set in the picturesque Sangre de Christo foothills. It is adorned with more than 100 art galleries, boutiques, artist studios and restaurants set in photogenic Adobe cottages. Each has a wealth of photo-worthy details. Notice the quaint courtyards and gardens, the hand-hewn Adobe gateways. Choose the settings and details that speak to you for your photographs. Compose and shoot. This is what cameras are made for! Santa Fe rewards wanderers and explorers. Get lost in the downtown streets searching out new sights and you will find many delights. Your kit or standard lens will do just fine on your photo walks. Keep your photo gear as light and portable as possible. Be sure to carry a spare battery and memory card as there is only one (high-priced) camera shop near the downtown Plaza. Enjoy your trip to Santa Fe, New Mexico! Bring back some wonderful memories and photos! 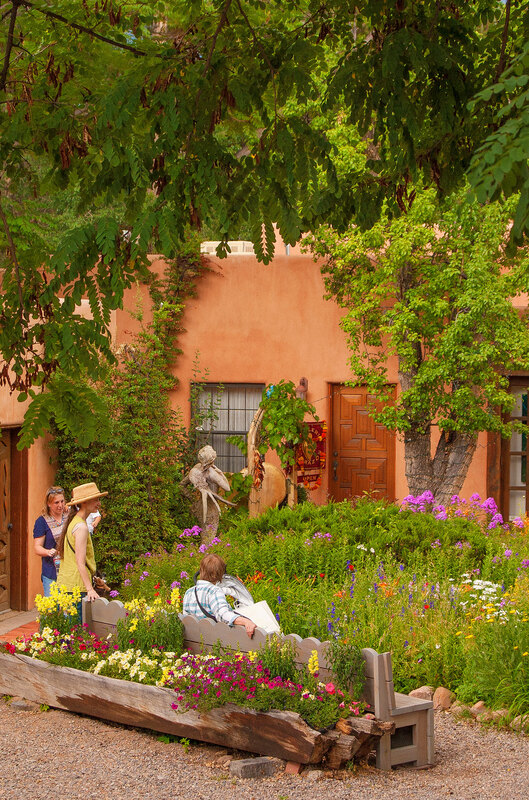 The above photo shows a restful garden setting on Canyon Road in Santa Fe. This is the courtyard for a group of art galleries photographed on a late summer day. These charming cottages served as homes in times past and are now art galleries and studios. 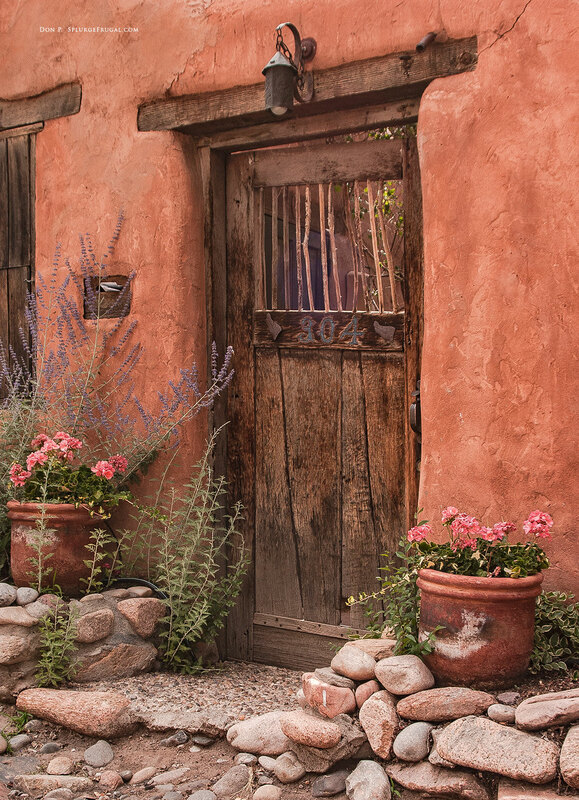 The lush flora of the Sangre de Cristo foothills is the perfect compliment for the pueblo style cottages. An overcast day provided even, shadow-free lighting that flattered this setting. 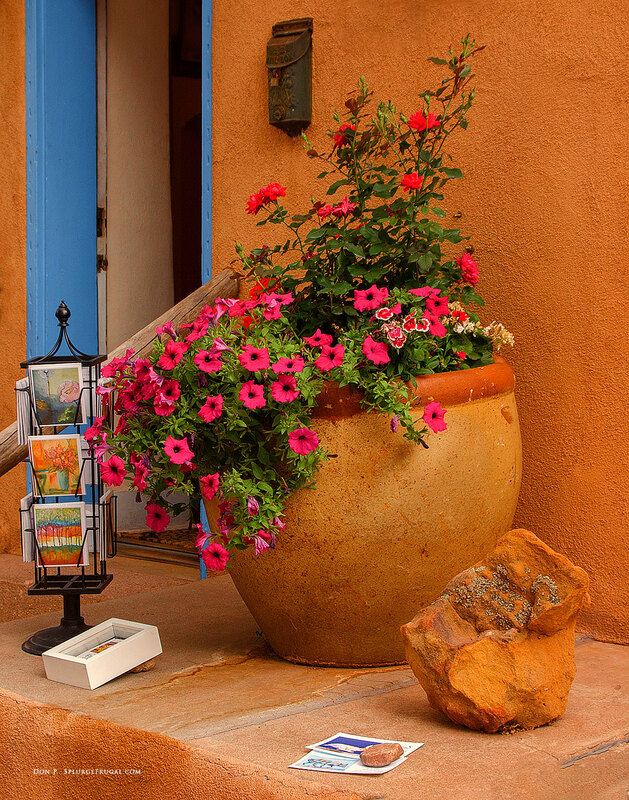 These photos of Santa Fe highlight the beauty and personality of this jewel of New Mexico. And what a colorful jewel it is! It benefits from an amalgam of cultural influences, each contributing to the history and beauty of this lovely city. Ancient Puebloan villages once populated this area of New Mexico. 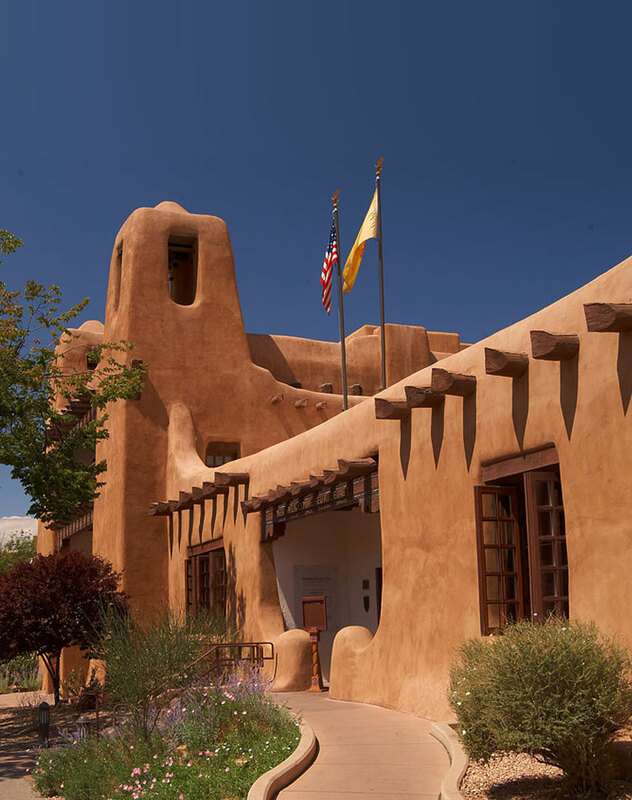 Their heritage is clearly seen in Santa Fe’s Pueblo-Revival style architecture. Santa Fe later became the capital of Spain’s southwestern territories and was later governed by Mexico. It became the state capital when the territory of New Mexico achieved statehood in 1912. Santa Fe, New Mexico is the third largest art market in America, behind New York City and Los Angeles. The Native American people of the pueblos have artistic traditions in pottery, weaving and jewelry-making that date back more than a millennium. The Spanish settlers of the 17th century brought artistic traditions from Spain and Mexico. Add to this the influx of painters and writers from the east coast of the United States during the early 20th century, including Georgia O’Keeffe and Alfred Stieglitz. Not surprisingly, this region rapidly became one of the most important art centers in America. 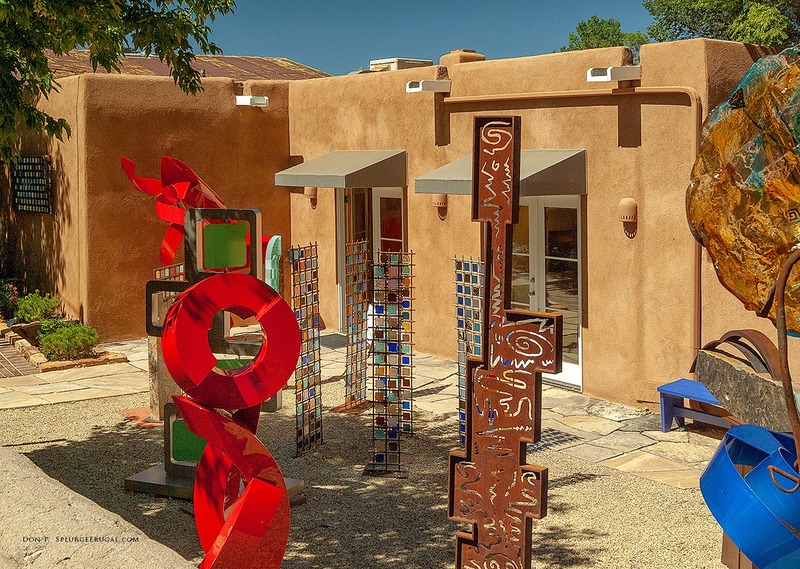 Santa Fe, New Mexico is the third largest art market in America, behind New York City and Los Angeles, and is a UNESCO City of Crafts and Folk Art & City of Design. 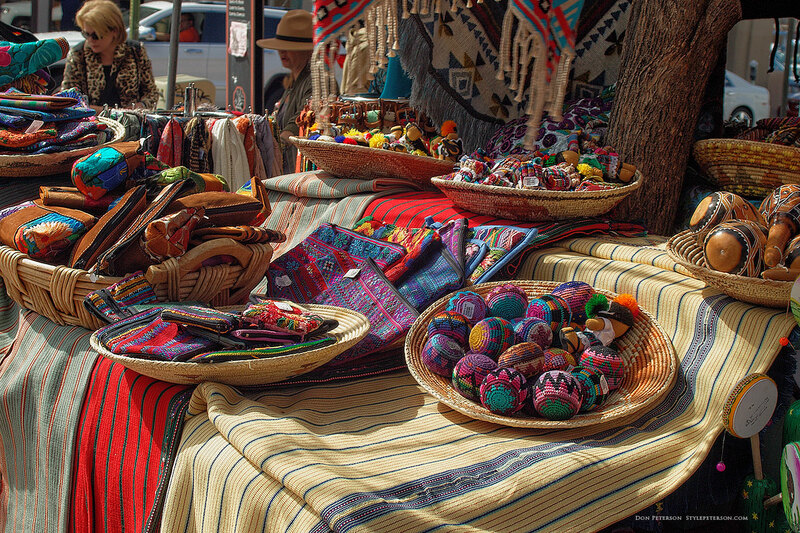 Santa Fe, New Mexico has outdoor craft vendors in its downtown markets offering a beautiful array of colors and textures to entice the eye! This market is located in downtown Santa Fe across the street from the landmark La Fonda hotel. The products reflect the Native American, Spanish and Mexican influences that shape local culture. Overcast days provide shadow-free conditions for focusing on the textures, colors and details that make Santa Fe so beautiful. Santa Fe is well known for its Pueblo-Revival architecture. This style of building was developed by the early ancestral Pueblo peoples of the southwest and was later adopted by Spanish missionaries in the 17th Century. In 1957, a committee led by John Gaw Meem drafted the Historical Zoning Ordinance in Santa Fe. This ordinance mandated the use of the “Old Santa Fe Style,” which encompassed “so-called Pueblo, Pueblo-Spanish or Spanish-Indian and Territorial styles,” on all new buildings in central Santa Fe. This ordinance remains in effect, giving Santa Fe its distinct architecture. 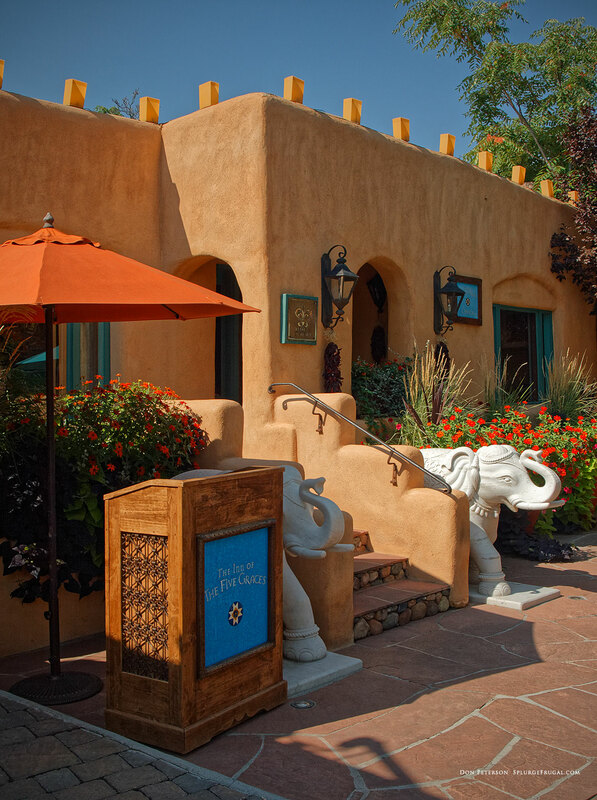 Along with its world-class art galleries, Santa Fe offers an enviable range of world-class dining options. 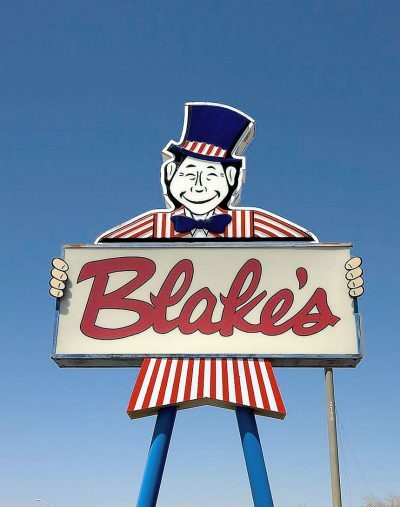 Whether you have a yearning for local New Mexico specialties or haute-cuisine, you will find it here. 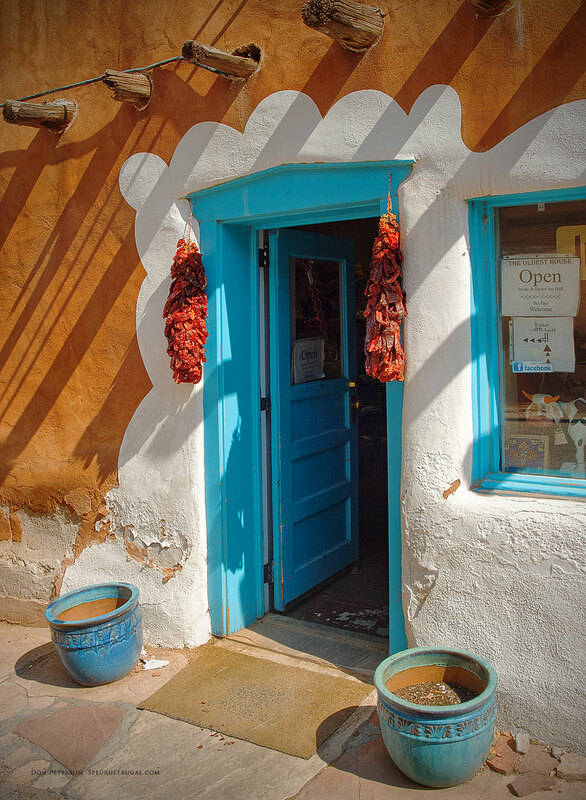 Innovative Southwestern fare created by award-winning chefs and hearty New Mexico dishes such as breakfast burritos and green chile stew have earned Santa Fe a prominent place on the world’s culinary map. If you’re hungry for Asian, French, Italian, Indian or Middle Eastern cuisine, you’ll find them all here as well. Are museums your thing? Santa Fe has something for everyone! On almost any given day here you might find yourself browsing among prehistoric ceramic pottery, an expansive collection of Brazilian folk art, and cutting-edge modern photography exhibits. 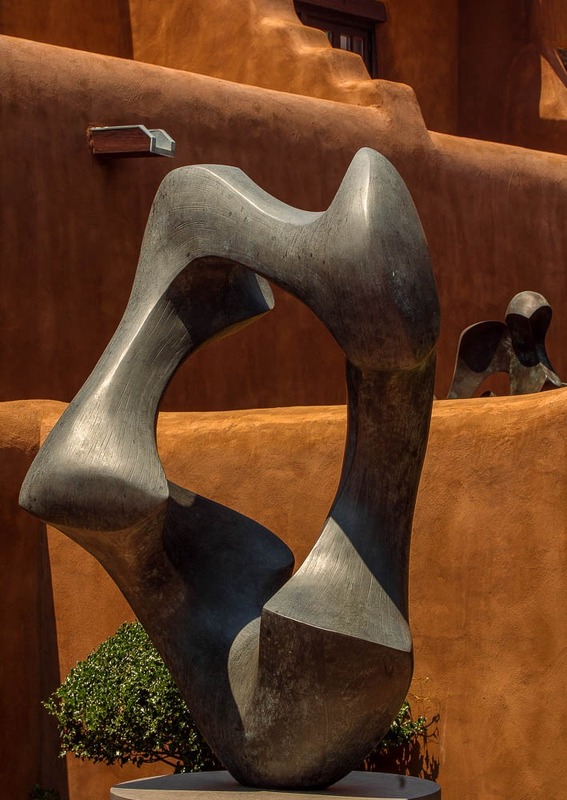 The photo below shows the New Mexico Museum of Art in Santa Fe, New Mexico. This timeless building was constructed in 1917 and represents (to my eye) one of the finest examples of Pueblo Revival Style architecture. Designed by Issac Rapp, it borrows from Native American and Spanish Colonial design styles. Its warm Adobe textures are complemented by the clear blue New Mexico sun. A day trip to Santa Fe, New Mexico offers a feast of visual delights best seen at an unhurried pace. Soak in the details. 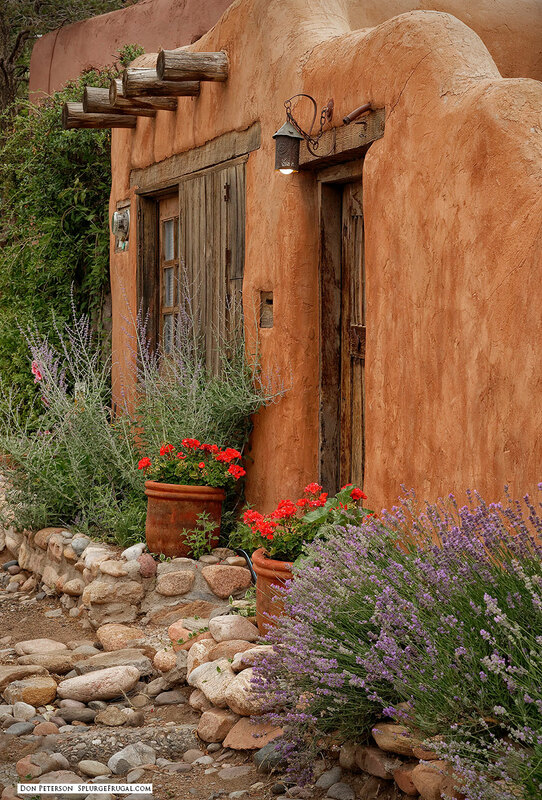 One of the most pleasant ways to spend an afternoon in Santa Fe, New Mexico, is by strolling along Canyon Road. 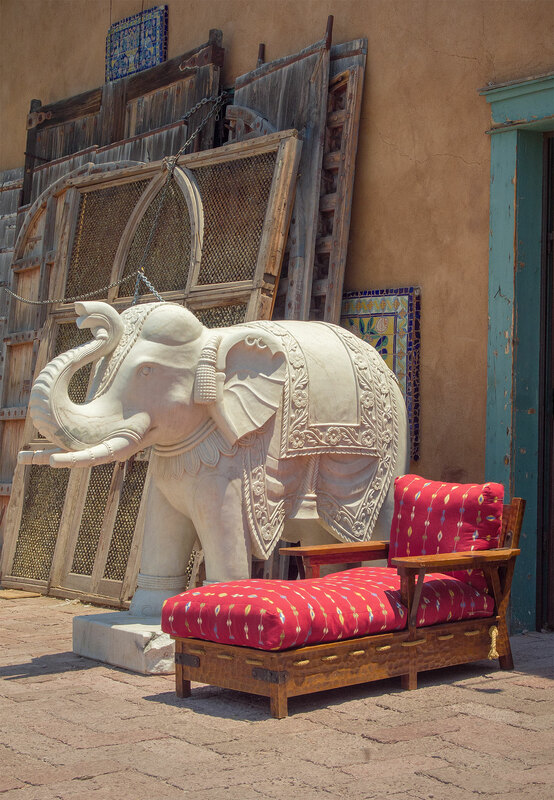 The gracious Adobe homes of Canyon Road offer a world-class collection of art galleries as well as restaurants and boutiques. Canyon Road looks its best in the spring and summer months when the flowers are in bloom and the afternoon sun kisses the Adobe textures with a warm, comforting glow. If you shot in your photos in the raw setting for post-processing in Adobe Lightroom or other photo editors, you may find these tips helpful. Photos of Santa Fe shot in midday sun tend to have dark shadows and over-exposed highlights. By lightening shadows, reducing contrast and recovering highlights you should be able to create very pleasing photos. Enjoy your trip to Santa Fe! To see more of my Santa Fe, New Mexico photos, check out the latest pics on my SplurgeFrugal Instagram page here! 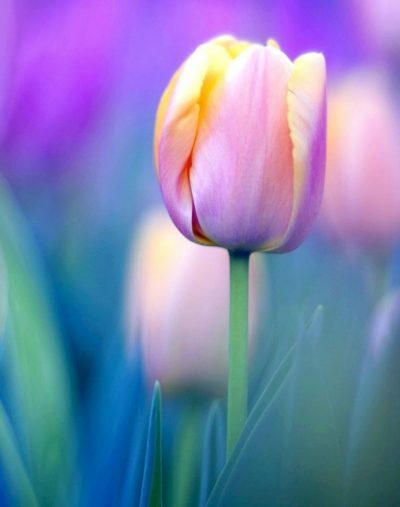 In Bloom: Tulips at ABQ Biopark!